When it comes to reliable dry cleaning and quality laundry service near Richardson, our Richardson customers know that they can always count on Bibbentuckers. 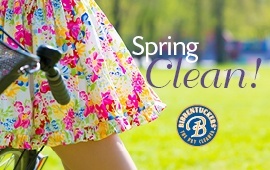 We make dry cleaning convenient and easy at an affordable price for anyone leading an active life. We have drive-through lanes at our dry cleaning stores to make it easier to deliver or pick-up your clothes. We highly encourage that you take advantage of our easy and FREE delivery/pick-up services from your Richardson home or office. Bibbentuckers provide the highest quality dry cleaning and laundry services with guaranteed satisfaction along with superior customer service. We strive to be the best dry cleaners in the Dallas and Fort Worth Metroplex including Richardson, Texas. Our experienced garment specialists and friendly dry cleaning team would love to have an opportunity to tell you why so many Richardson customers trust us with their dry cleaning needs. You don’t have to take our word for it. Instead, we highly recommend you read our online dry cleaning reviews to hear about their wonderful experience during their visits at our dry cleaning stores in the Dallas and Fort Worth area. We’re ready to help you as soon as you arrive.